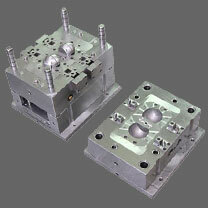 Home » Technologies » Can I eliminate parting line on molded plastic parts? You need to review those mold drawings, BOM and verify if the materials used were actually used and if they are the correct materials for your type of plastics and processes. As for mold closed polishing, use an intense light to shine against the slide seal/offs if you see light, you have a bad fit, spotting blue and steel on steel transfers will tell you visually as well. Once noted as a defect, hard stone the area flat if possible, a surface grinder is best, but sometimes not useable for the application, old school machining and a master toolmaker will take care of those issues in a jiffy. Parting line witness occurs as metal is removed it opens up tiny gaps due to poor surface finish on the faces butting together. So the very very smooth grinding finish as above is needed. Or very slight mismatch due to movement in a poorly designed mold. Its not rocket science just good old fashioned tool making, that present day precision machinists know nothing about. Fit is the most critical to any good product, but fit is only good if the materials used in the mold itself will withstand the type of process required for repeatedly injecting quality products. Then it all comes down to materials used for the plastic product, ie. Does this have a special type of aggressive filler compound and will the robustness of said tooling absorb the shock of these temperatures used for the materials? If the parting line can not be avoided in designing, molding technique and material grade selection can eliminate or reduce it. You need to get a real good mold maker and better use hard tools steels for molds and choose some suitable plastic material which also can help you on this. Sanding block and person doing each part by hand will be last choice.